If the command given by Jesus is to make disciples of all nations (or ethnic groups), then common sense would tell us our job is to find those nations (ethnic groups) that have not been discipled (taught to be followers of Christ). People desiring to fulfill the Great Commission need to know where these "unreached" groups of people are, so that our efforts in completing the task will not just be busy but productive. The vast majority of these unreached people live in an area of the world nicknamed the "10/40 window." The 10/40 window is simply a term used to describe a region of the world within 10 and 40 degrees latitude from Western Africa to Eastern Asia. If you were to draw it on a map, the top would go from Portugal through Japan and the bottomwould go from Guinea through the bottom tip of India all the way to the Philippines. This is an important region to think about as a World Christian because most of the people who have not had an opportunity to hear the gospel live here. The 31 least reached countries in the world are in this "window." The people who are lost in the 10/40 Window are not "more lost" than your neighbor or family member who does not know Christ. But, they are "unreached" in the sense that they have not had an opportunity to hear the Gospel. The issue is not their lostness, but their access to the Gospel. People can be unevangelized without being unreached. There are people in the United States that have not heard the gospel, but they could if they wanted to. Most people living in the 10/40 window couldn't find out about Jesus even if they wanted to! These are unreached people who do not have access to the gospel. There are over 3.6 billion unreached people in the world today. Of those 3.6 billion people, 88% live in or near the 10/40 window. Only 2.17% of these unreached people live in North and South America combined! This area of the world is so unreached for several reasons. First, these people do not live in a spiritual vacuum. The world's major religions began in this part of the world and are firmly entrenched there. In the 10/40 window there are 724 million Muslims, 787 million Hindus, and 240 million Buddhists. Along with that, many of the countries in this region are oppressive to Christianity. Regardless of these facts, Jesus declared that, "the harvest is plentiful but the workers are few." The biggest reason this part of the world is so unreached is because there is a lack of Christians willing to go to these places. It is estimated that only 4% of foreign missionaries today are working to reach these unreached people. 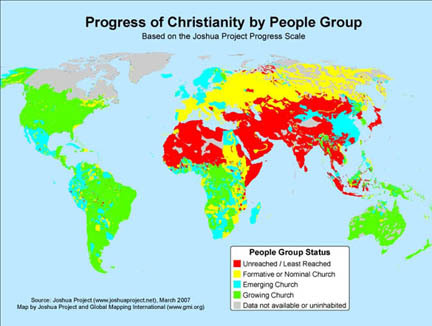 The other 96% are working in unevangelized, but not unreached areas. According to the World Christian Encyclopedia of all the money designated for "missions" in the U.S. only 5.4% is used for foreign missions. Of that 5.4%, only 0.37% is used to take the gospel to unreached people who don't have access to the gospel. That's about two cents out of every dollar given to missions! The rest goes towards efforts to further evangelize reached people. Martin Luther King Jr. said, "Nothing in the world is more dangerous than sincere ignorance," and that proves true in our global strategies for advancing God's kingdom. We must take the time to educate ourselves on what the world looks like and evaluate our efforts in line with God's command to make disciples of all people groups. Dr Luis Bush, International Director of the AD 2000 & Beyond Movement writes on evangelism among unreached people groups. If we are faithful to the Scriptures, obedient to the mandate of Christ, and unwavering in our commitment to plant churches within every people and city, then we will get to the core of the core —- the 10/40 Window. The core of the unreached people of our world live in a rectangular-shaped window! Often called "The Resistant Belt," the window extends from West Africa to East Asia, from ten degrees north to forty degrees north of the equator. This specific region, which has increasingly become known as The 10/40 Window, encompasses the majority of the world’s Muslims, Hindus, and Buddhists - billions of spiritually impoverished souls. As we approach the end of this millennium, it is imperative that our evangelistic efforts be focused among the people who inhabit The 10/40 Window. If we are serious in our commitment to provide a valid opportunity for every person to experience the truth and saving power of Jesus Christ, we cannot ignore the compelling realities within this region. • seventh, the strongholds of Satan within The 10/40 Window. The first and most fundamental reason why committed Christians must focus on The 10/40 Window is because of the biblical and historical significance of this area. Indeed, the Bible begins with the account of Adam and Eve placed by God in the heart of what is now The 10/40 Window. God’s plan, expressed in Genesis 1:26, was that mankind should have dominion over the earth, subduing it fully. However, Adam and Eve sinned against God and forfeited their right to rule. Mankind’s sinful behaviour increased until God intervened and judged the earth with a cataclysmic flood. Then came mankind’s futile attempt to establish new dominion in the building of the great Tower of Babel. That effort, which also occurred in the heart of The 10/40 Window, was an open defiance against God. Once again, God reached forth his hand in judgment. The result was the introduction of different languages, the scattering of earth’s people, and the formation of the nations. In The 10/40 Window we can see clearly the crucial truth expressed in Graham Scroggie’s book The Drama of World Redemption: "A World having turned from God, He left it and chose a man through whom He would ultimately by Christ reach the world." Certainly we can see how ancient history ran its course in the territory marked by The 10/40 Window, from the cradle of civilization in Mesopotamia across the fertile crescent to Egypt. Empires rose and fell. The fate of God’s people Israel varied in relation to their obedience to his covenant. It was here that Christ was born, lived a perfect life, died sacrificially on the cross, and rose triumphant over death. The church age was ushered in, and it was not until the second missionary journey of the Apostle Paul that events of biblical history occurred outside the 10/40 Window. Without question, this is an area of great biblical and historical significance. The second reason why committed Christians should focus on The 10/40 Window is because it is home to the majority of the world’s unevangelized people. The "unevangelized" are people who have a minimal knowledge of the gospel, but have no valid opportunity to respond to it. While it constitutes only one-third of earth’s total land area, nearly two-thirds of the world’s people reside in The 10/40 Window. With a total population nearing four billion, The 10/40 Window includes 61 countries, both sovereign states and nonsovereign dependencies. Those countries with the majority of their land mass lying within the boundaries of The 10/40 Window are included. Of the world’s 50 least evangelized countries, 37 are within The 10/40 Window. Yet those 37 countries comprise 95% of the total population of the 50 least evangelized countries! Such a fact leaves no doubt that our challenge in reaching the unreached must centre on the core — The 10/40 Window. If we take seriously the mandate to preach the gospel to every person, to make disciples of all peoples, and to be Christ’s witnesses to the uttermost part of the earth, we must recognize the priority of concentrating our efforts on The 10/40 Window. No other area is so blatantly in need of the truth that salvation is only in Jesus Christ. A third reason we must focus on The 10/40 Window is evident in the fact that it contains three of the world’s dominant religious blocs. The majority of those enslaved by Islam, Hinduism, and Buddhism live within The 10/40 Window. Viewing the map from left to right the Muslim world can be seen most prominently in a wide band across the north of Africa into the Middle East, a bloc representing over 700 million persons. In the middle of the map, overshadowing the subcontinent of India is the presence of Hinduism, also constituting a population of more than 700 million. On the right side of the map is the Buddhist world, encompassing the whole of China. From its centre in The 10/40 Window, Islam is reaching out energetically to all parts of the globe; in similar strategy, we must penetrate the heart of Islam with the liberating truth of the gospel. We must do all in our power to show Muslims that the highest prophet described in the Koran is not Mohammed, but Jesus Christ. And that He is not only the greatest prophet, but the Son of God Himself who died and resurrected in order that millions of Muslims may be saved. Overwhelmed with poverty and ravaged by disease, India is victimized even more severely by the spiritual blindness of Hinduism. To a nation in which fattened cows roam freely among emaciated humans, we must proclaim the truth that Jesus came to give us life, and give it abundantly. Although officially an atheistic country since the Marxist revolution of the late 1940s, China is nevertheless influenced deeply by its Buddhist roots. Some scholars, in fact, consider China’s true religion to be a combination of atheism and Buddhism. In actuality, religion in China is a hodgepodge which includes folklore, mysticism, animism, and occult practices. Regardless of how one may assess the situation, the fact remains that 1.2 billion Chinese are in desperate need of Jesus Christ. They represent the largest identifiable block in The 10/40 Window. A fourth reason we must focus on The 10/40 Window is because the poor are there. Of the poorest of the poor, more than eight out of ten live in The 10/40 Window. On average, they exist on less than $500 per person per year. 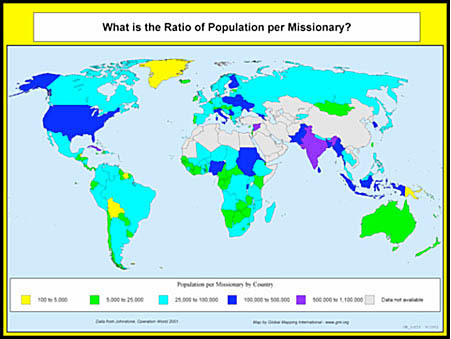 Although 2.4 billion of these people live within The 10/40 Window, only 8% of all missionaries work among them. Bryant L. Myers, in his perceptive article entitled, "Where Are the Poor and Lost? ", states that "the poor are the lost, and the lost are the poor." He arrived at this conclusion after illustrating that the majority of the unreached live in the poorest countries of the world. When Christians from 170 countries gathered at Lausanne II in Manila in 1989, great concern was expressed for the materially poor. In the second section of the Manila Manifesto, that concern was recorded in the following declaration: "We have again been confronted with Luke’s emphasis that the gospel is the good news for the poor (Luke 4:18; 6:20; 7:22) and have asked ourselves what this means to the majority of the world’s population who are destitute, suffering, and oppressed. We have been reminded that the law, the prophets, the wisdom books, and the teaching and ministry of Jesus all stress God’s concern for the materially poor and our consequent duty to defend and care for them." Committed Christians cannot ignore the reality that there is a remarkable overlap between the poorest countries of the world and those which are the least evangelized. The fifth reason we must address our concerns on The 10/40 Window is because it contains the largest spiritually bankrupt ethnolinguistic megapeoples (over one million). In fact, over 90% of the individuals in these people groups live in The 10/40 Window. The sixth major reason we must focus on The 10/40 Window is because it contains the overwhelming majority of the world’s least evangelized megacities - that is, those with a population of more than one million. Of the top 50 cities on this list, all 50 cities are in The 10/40 Window! This fact alone underscores the need for prioritizing our efforts to reach each of these great metroplexes with Christ’s love and truth. Reason number seven for focusing on The 10/40 Window is that it includes numerous strongholds of Satan. The billions of people who live in The 10/40 Window have suffered not only the ravages of poverty and disease, they have also been kept from the transforming power of the gospel. The are poignant examples of the truth expressed in 2 Corinthians 4:4, which states that "the god of this age has blinded the minds of unbelievers, so that they cannot see the light of the gospel of the glory of Christ, who is the image of God." We must not view this situation with a fatalistic attitude, for we have been granted power to intervene. In a later passage of the same letter, the Apostle Paul declares: "For though we live in the world, we do not wage war as the world does. The weapons we fight with are not weapons of the world. On the contrary, the have divine power to demolish strongholds" (2 Corinthians 10:3-4). Although Satan has established a territorial stronghold in The 10/40 Window, we must not concede one parcel of land nor one person. The gospel must advance! Looking back across the pages of history we discover a heartening story about spiritual warfare in the writings of the prophet Daniel. A fervent man of prayer, Daniel was highly esteemed by God and by the people of his generation. On one occasion, while waiting on God in prayer, Daniel fasted on bread and water for three weeks. Finally, a majestic angel whose appearance was as lighting brought an answer to his prayer. He assured Daniel with the promise that "...your words were heard, and I have come in response to your words" (Daniel 10:12). However, the angel then went on to explain how, en route to answer Daniel’s prayer, he was detained for 21 days by the demon assigned to the Persian king (Daniel 10:13). It was only when the archangel Michael arrived to help that he was able to free himself from the battle to go to Daniel. This fascinating passage unveils the reality and territorial nature of the spiritual battle in the heavenlies. The angel who visited Daniel announced that he would have to return to the battle over the Persian kingdom. Apparently, that battle still rages, for ancient Persia is now modern-day Iran. Still a stronghold zealously held by Satan, Iran is situated at the center of the The 10/40 Window. George Otis, Jr., has concluded that two powerful demonic forces, with great biblical significance, stand at the epicenter of the unreached world - the prince of Persia (Iran) and the spirit of Babylon (Iraq) - and both must be penetrated with the gospel before the Great Commission can be completed. Otis observes that this will occur in the region of the Garden of Eden, where the command to "subdue the earth" was originally given. It is evident that the forces of Satan have great power and will resist all attempts to be overcome. If we are to storm the enemy’s territory, we must put on the full armour of God and fight with the weapons of spiritual warfare described in Ephesians 6. To depend on anything less is utter foolishness. The focus of the concerned Christian community 200 years ago was for the coastlands of the world. A century later, the success of the coastlands effort motivated a new generation to reach the interior regions of the continents. Within the past decades, the success of the inland thrust has led to a major focus on people groups. More recently, the world’s burgeoning megacities have also become focal points of concern. Today, rapidly approaching the third millennium since Christ, we are wise to concentrate our efforts on The 10/40 Window. Of course, this calls for some of us to reevaluate priorities. We must find the most innovative ways to reach billions of people within The 10/40 Window with the love and truth of Jesus Christ. We must mobilize for a massive prayer focus on The 10/40 Window with the body of Christ worldwide. However, it must be clearly understood that concentration on The 10/40 Window does not mean a curtailing of Christ’s work going on elsewhere around the globe. Missionary endeavours, in evangelism, training, relief, development, church planting, and mobilization for cross cultural missions should go on unhindered. If we are faithful to the Scriptures, obedient to the mandate of Christ, and unwavering in our commitment to plant churches within every people and city, then we will get to the core of the core — The 10/40 Window. May God grant each of us boldness and wisdom and energy to do our part in taking on this great and eternally significant challenge. By all means, get involved! This article was written by Luis Bush, International Director of the AD 2000 & Beyond Movement.